Already bolstering a line-up that spans from viking metal to industrial and touching on other genres in between, Valkyrian Festival have announced a further three bands to this year’s bill. Confirmed for the Friday are Nottingham’s very own buccaneers of pirate metal Red Rum, who have also recently been confirmed for the Warhorns Festival. Red Rum will be joining Ravenage, Dead Man’s Conspiracy and Scotland’s djentlemen Storm of Embers on the first night of Valk-Fest. Added to the more extreme metal stylings of Saturday are Leeds-based extreme metal tyrants Lammergeier who will be bringing their devilishly heavy sound which will no doubt go down well alongside the other other extreme metal acts on the bill such as Scottish corporate black metallers Maelstrom and fellow Yorkshire band Narcotic Death whose vocalist can apparently castrate a cat from a distance of 400 yards. And for industrial fans, Sheffield-based industrial duo The Gifted have been confirmed to play the final night of Valk-Fest 2013 with acts such as Spekulus, Powercake, Dakesis and Yorkshire’s most violently brutal band Severed Heaven. With another four bands to be announced, this year’s Valk-Fest is already shaping up to be its most diverse line-up. This year, Valkyrian Festival is in aid of RapeCrisis. Information on RapeCrisis can be found at this location. Donations can be made direct to the charity via the Valkyrian Festival JustGiving page which can be found here. Weekend tickets can be found at this location for the low price of £5 (excluding P&P). 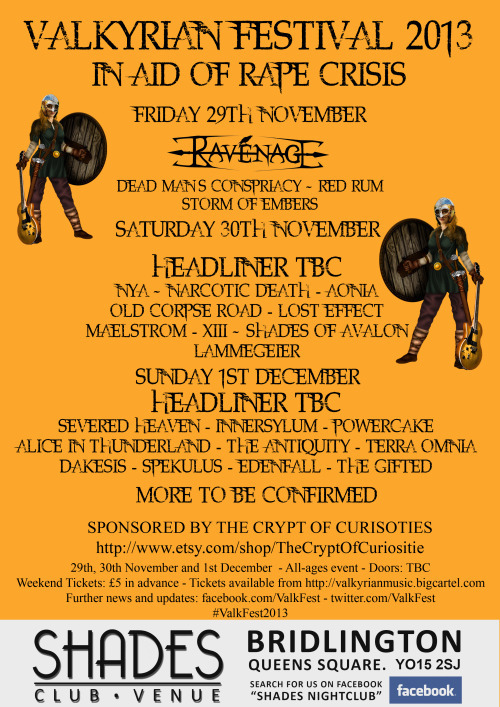 Valkyrian Festival 2013 is now officially sponsored by online gothic and custom-made jewellery store, The Crypt Of Curiosities. In related Valkyrian Festival news, Aonia will be headlining a Valk-Fest fundraiser at Shades Nightclub, in Bridlington on 7th September with support from Powercake, Spekulus and Penance, the latter of which [performed at last year’s Valk-Fest. Further support acts to be announced and a lot more bands are still to be announced for Valkyrian Festival 2013. Further Valkyrian Festival announcements and info can be found here. Nottingham – or at least that general area – was once the fabled home of Robin Hood and his band of merry men but today Nottingham finds itself to be the location of a new band of outlaws – the six piece pirate metal band Red Rum, though somewhere with a harbour or some sort of dock might be a more appropriate base of operation for the band. The EP opens up with Red Rum, a track laden with waves of keyboards and man crashing portside and lashing guitar passages crashing starboard side. The vocals conjure up fond memories of the days of Running Wild, only much scurvier and fierce. The keyboard passages cut their way through the song like a sharp cutlass, leading the symphonic-orientated assault through the waters of raging guitars. Dragged Out With The Tide begins sounding like smooth sailing with a subtle use of mandolin before the brewing storm of guitars blast in like cannons with the heavy bombardment of bass and drums that come crashing down like a belaying pin to the back of the head. Rise From The Deep brings a spring upon her cable, offering no quarter with furious lashings of keyboards and mandolin sharper than a crack of the cat o’ nine tails with six pounder blasts of drums that navigate the rest of the instruments through the storm-laden waves. The vocals are at their most sinister during this track, swaying more to the death metal side of the vocal sea. The guitars act as the coxswain for Legends before the commanding use of vocals make themselves known. The instrumentation during in this track navigates itself well with passage being as memorable as the last. 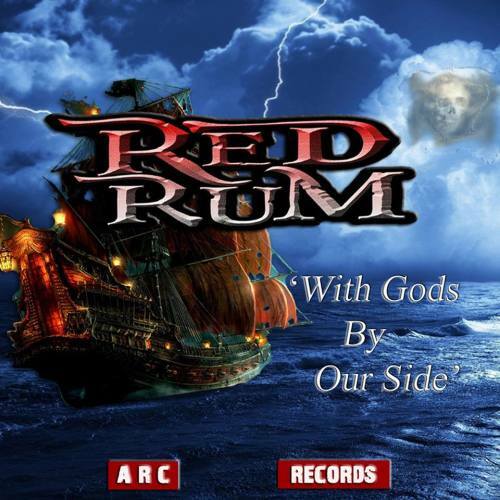 Ragnarok is the last port of call for Red Rum, the track itself being haul winded into the Nordic waters of the song. The essence of the previous pirate themes still remain however, keeping the band sailing true with their scurvy sound. From leaving the first port and arriving in the last, Red Rum takes you on a handsome journey of plunder and piracy. 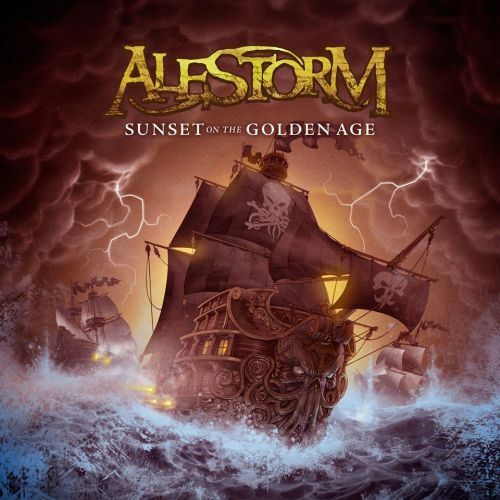 Whilst straying from an Alestormesque sound, the band have being able to weave their own sound – the kind that isn’t complete without a clap of thunder or a shot of Nelson’s folly.